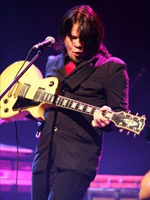 Composer/guitarist Mark Dannells is a graduate of the prestigious Berklee College of Music. Post graduation, he joined several touring bands that performed thousands of dates over the next several years. His playing eventually received national attention and he was invited to audition for such acts as Nine Inch Nails, Red Hot Chili Peppers and Kenny Wayne Shepherd. In 2001, Dannells was asked to join Atlanta based Elektra Recording artists Brand New Immortals, a band that included former Black Crowes and Train bassist Johnny Colt and singer/guitarist (now with John Mayer) David Ryan Harris. Dannells has also played with producer/singer/songwriter Butch Walker, GRAMMY® nominated singer/songwriter Angie Aparo, and multiplatinum rockers Skid Row. He was also involved with Jupiter Tunes (now owned by Getty) where he had numerous original compositions placed in commercials, websites and corporate functions. Currently, Mark writes for his band, the electro/rock/funk group The Greater Vavoom. He is also backing up British singer/songwriter Jim Stapley, a new artist on Keifer Sutherland’s Ironworks Records.